Strawberry frozen yogurt sprinkled with blueberries. Frozen yogurt with no added sugar, lots of fruit, and a texture as rich and velvety as ice cream? It’s not an impossible dream. This recipe has only strawberries, pears, plain Greek yogurt, a dash of milk and Truvia. 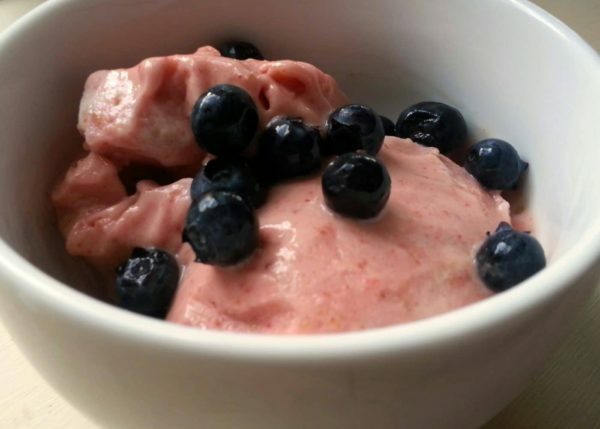 Last year I splurged on a Vitamix to simplify ice cream making and other tasks, and I’m glad I did – in less than a minute, I can transform whole frozen fruits into smooth and creamy frozen yogurt, sherbets, sorbets and ice creams. And given that most $50 blenders seem to burn out after a year of heavy use, this one will end up paying for itself in a few years. In addition to giving high marks to the Vitamix Professional Series 750, the Vitamix 7500, and the Vitamix Professional Series 3500, Consumer Reports gave high marks in its recent blender tests to Blendtec Designer, Dash Chef Series Digital, and the Ninja Professional Blender NJ600. But if you don’t have a blender with similar horsepower and aren’t ready to shovel out the dough, you can use a food processor instead. I used to use a small, 2-cup food processor to make single servings of frozen dessert on the fly – it just took a longer processing time, and I usually needed to add a little milk or juice to smooth out the mix. Using small frozen fruits (like raspberries, or sliced strawberries) and letting them thaw for a few minutes before blending also helps. Take a jar of pear sauce (or applesauce, if pear isn’t available) and pour it into an ice cube tray. Freeze. Put everything in the blender and turn to high power following your blender manufacturer’s instructions. Use the blender’s tamper to force the ingredients into the blades as it blends. If your blender doesn’t have a tamper, stop it every 15 seconds to move the chunks toward the blades and the smooth stuff away. Blend until smooth (30 seconds to a minute in a Vitamix), but don’t overblend or it will start to melt. Scrape from the blender. I use an ice cream scoop to make it pretty. Tomorrow I'm going to try this. I love yogurt. This looks very good! I love that you used Truvia and that the ingredients are very minimal! Might have to try this soon! Thanks! I started making frozen desserts in my blender because it was hard to find stuff without a lot of sugar in it. I am really happy with how well they usually turn out. And it's great to have a frozen treat that's actually good for me!